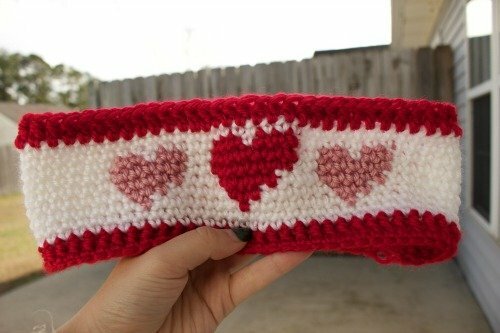 This Queen of Hearts Ear Warmer Crochet Pattern designed by Nicole Motovidlak is perfect for Valentine’s Day or anytime you’re wanting to show some love!! And today she is sharing the pattern free with P2P readers! If you are not yet acquainted with her, Nicole is a creator and designer behind owner of Yarn and Imagination and sells ready to ship items as well as her original patterns on Etsy and Craftsy. 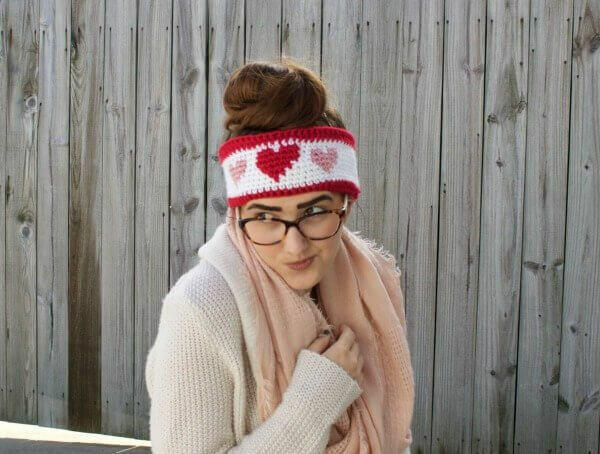 And today she is here to share one of her designs with us … this adorable Queen of Hearts Ear Warmer Crochet Pattern … her free gift to P2P readers!! Be sure to stop by her Facebook page or on Instagram and give her a big thank you! Valentine’s Day is coming! What is a better way to spread some love than with an ear warmer with hearts? It is a cute and cozy winter accessory, and you can make it yourself, or for your friends! Wouldn’t it make a great gift? This pattern is intermediate, due to the frequent color change and chart reading. If you think you can take on the challenge, be my guest! It’s a quick project, too. Click here to download or print the free pdf of the Queen of Hearts Ear Warmer crochet pattern. My name is Nicole Motovidlak and I am the creator behind Yarn and Imagination. I began crocheting (and knitting) as a child. Since then I have become proficient in both, enough to start creating my own patterns. I sell them and finished products. When it comes to crocheting or knitting, all you need is a little yarn and imagination! If you would like to follow me for updates, you can find me on Facebook and Instagram. I also have an Etsy store where you can find my patterns and products. And if you check out Craftsy, I have some cute amigurumi patterns available for free! Am I understanding your pattern correct? Can you help me please? If Im understand it correct the start/end of a row is at the side of the work, not centered at the back? Thank you.